Gill is a certified Personal Trainer through the Health and Fitness Professional Association (HFPA) in 2004. 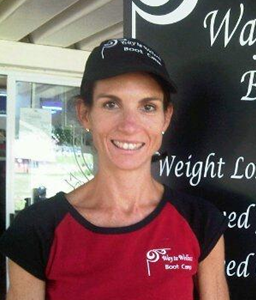 She started personal training in 2005 – assisting others to achieve their health and fitness goals. Gill is a competitive long distance athlete competing in races like the Two Oceans and Comrades Marathons. Her running highlight was qualifying for the SA Marathon Championship 2011 and taking 3rd Lady Vet/15th Lady. Her other running achievements include Comrades 2011 – 5th vet and 23rd lady overall and completing the Vaal marathon in under 3 hours, her personal best of 2 hours and 57minutes. She came 2nd overall. Started Way to Wellness Boot Camp in Fernbrook Estate in 2007. Started Boot Camp at St Stithians in 2010. Started Boot Camp at Dainfern College in May 2012. Started Boot Camp at Yum in 2014. Gill has had a 100% success rate in terms of improved fitness levels and steady weight loss. This has guaranteed the growth in the business.